I've come to adore hostess gifts, those tokens of appreciation that you take when someone has kindly invited you into their home. A beautiful bottle of balsamic vinegar, a pair of handmade candles, a jar of jam from Ayers Creek; simple and inexpensive but something the hosts may not always buy for themselves. Something of the sort came our way the other evening when the Famous Publisher arrived for dinner, bearing a gift of coffee grown and roasted by a friend of his. And not just an ordinary bag of beans, but one with a back story that sounds like something out of a Gabriel Garcia Marquez novel. It seems that at the end of the 19th century, Jaime Oliver Mayol, as part of the settlement of a debt, came to own a coffee plantation in the high country around Ponce, Puerto Rico's second-largest city. The U.S. government, in control of the island as a result of the Spanish-American War, had forbade Puerto Rican coffee growers from trading with Spain, up to that time the island's premier market. 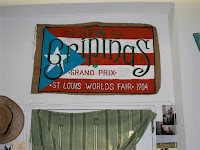 So Jaime got the crazy idea to take his coffee to the St. Louis World's Fair in 1904, where it won the grand prize. Despite this personal coup, his career as a coffee baron was sadly hampered by the aftermath of the war and a devastating hurricane that hit the island, and it wasn't until his grandson, Miguel Angel Sastre, took the reins of the plantation that the business started to turn around. Miguel formed a coffee cooperative in 1938 that eventually claimed 17,000 members, requiring a baseball stadium to hold its meetings. Though decades later the family had sold off all but the highest mountain property, the original name of the plantation, Gripiñas, was given to the town that grew up around it. 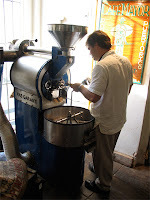 Jaime's great grandson, Luis Valldejuly Sastre, now minds the property and has opened his own cafe and roastery in Ponce called Café Mayor, reputed by FP to have "the best coffee on the island, por mucho." A replication of the original design of the coffee sacks from the Gripiñas plantation graces the bags. We can only hope that someday his product will reach our shores, its rich and unsweetened-chocolate notes a nice departure from the heavy Italian brews we've become so used to. Details: Read more about Luis and his café on the Rotund World website, with articles here, here and here. Browse a short and fascinating island history on the Wiki.